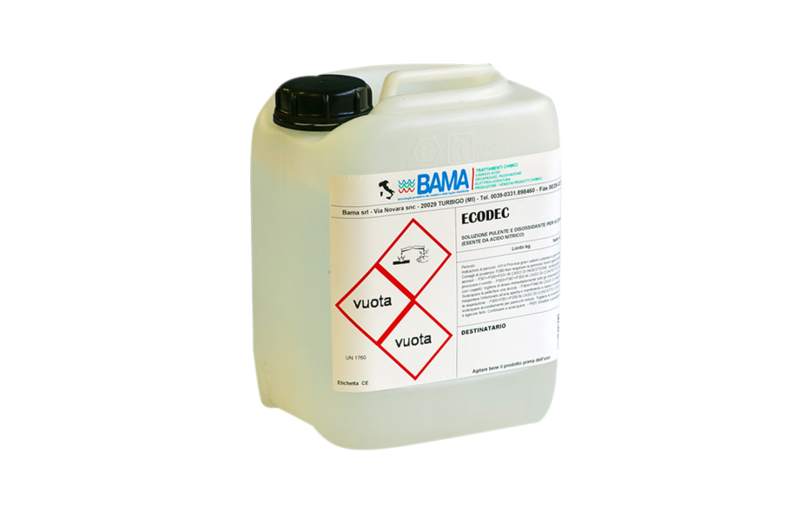 BAMA ECODEC is a liquid product, free of nitric acid, characterized by a DISOSIDANT action on the surfaces of INOSSIDABLE STEEL. It is a liquid product, free of nitric acid, characterized by a strong deoxidizing action on stainless steel surfaces. BAMA ECODEC must be carefully shaken before each use. BAMA ECODEC can be applied: by spray on the metal surface using a cloth soaked on the area to be treated by immersion of the product in the solution. The product can be used as it is or diluted in water. The concentration to be used depends on the degree of oxidation of the surface to be decontaminated. The reaction times of the product range from a few seconds to a few minutes and depend on the type of steel, the operating temperature and the amount of oxidation. BAMA ECODEC is available for sale in 5kg tanks (sales code: ED5) 10kg (sales code: ED10), 25kg (sales code: ED25). BAMA ECODEC must be stored in a place protected from high temperatures and direct sunlight.